Emlyn Roberts-Harry’s review for April is the story of a country singer trying against all odd to get to Nashville. At the time of going to press it wasn’t scheduled to be screened in any of Swansea’s larger cinemas – come on Vue and Odeon, not everyone wants to watch superhero or children’s films. Thank heavens for the Taliesin which will be showing Wild Rose on Wednesday 22 May at 16.45 and 19.30. Call the box office on 01792 604900 or 604999 to book tickets and please tell them Bay magazine sent you. Playing out a bit like a Glaswegian answer to A Star Is Born, Wild Rose marks the latest barnstorming turn from rising star Jessie Buckley after her superb performance in last year’s Beast. This time around, though, it’s a considerably more upbeat, accessible affair (which is not to knock Beast in the slightest, and you should definitely watch it if you get the chance) with much more mainstream appeal and should with any luck, alert a bigger audience to the considerable talents of this hugely charismatic actress. She plays Rose-Lynn, a young girl from Glasgow who’s just been released from prison and has returned home to her mum and two kids. Free-spirited and unpredictable, she has a dream of making it to Nashville and becoming a country singer, but her lack of money and responsibilities at home prove a problem. As before, this is a very different beast from Beast, and Buckley’s performance as Rose-Lynn is as wild, uninhibited and irresistibly charming as she was taciturn, buttoned-down and repressed in her starring turn from last year. It’s a firecracker of a character, with showmanship, energy and natural magnetism to burn, and Buckley is simply terrific. She never lets you forget Rose-Lynn’s worries and insecurities as a working-class Glasgow girl, but it’s the verve and spirit that dominate. It’s a proper thousand-watt star-making performance, and if there’s any justice whatsoever the offers will start piling up on her doorstep after this. She’s one to watch, no doubt about it. It’s the sort of performance a film like this demands, to grab the audience right from the off and make them believe, as Rose-Lynn’s prison friends do, that this person really could be the next Dolly Parton. (And maybe she could in real life – in addition to singing, Buckley wrote a great many of the songs featured herself.) So many of the other characters in the film, with the notable exception of her long-suffering mum played by the invariably excellent Julie Walters, are instantly taken with her and throw their efforts behind making her a star, which is the kind of thing that risks ringing wholly false if we don’t believe it too. Luckily, it’s never in any doubt, and we’re rooting for her every bit as much as her supporters in the film. 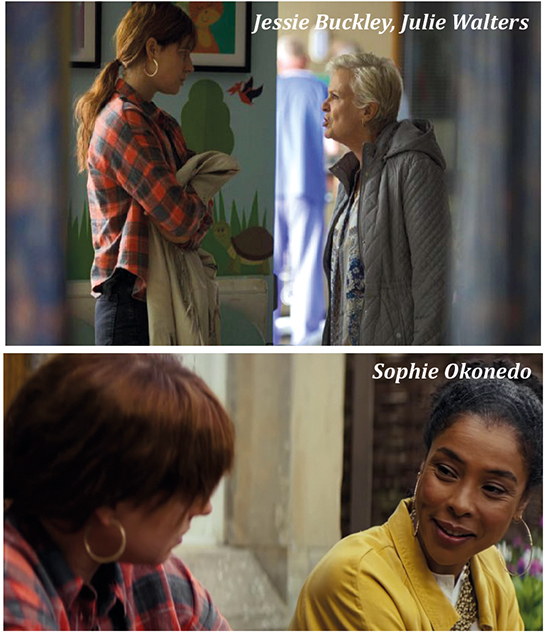 It’s also the one area where Wild Rose stumbles a little, with Sophie Okonedo’s character, a well-off woman who hires Rose-Lynn as a cleaner and becomes her biggest champion after hearing her sing. Okonedo is a brilliant Shakespearean actress and gives her all to the part, so it’s a shame that her role feels comparatively underwritten. She exists pretty much solely to facilitate Rose-Lynn’s story and has very little inner life of her own; it’s far from a deal-breaker, but it is a pity that such a gifted actress wasn’t given more to do. Happily, there’s precious little else here that feels under-developed, and Rose-Lynn’s fraught relationship with her mum is one of the most hard-hitting aspects. It would have been so easy for Marion to be a straightforward antagonist figure, a buzzkill who just brings our plucky heroine down by reminding her of her boring but important day-to-day responsibilities. But because she’s so well-defined in the script and so wonderfully played by Walters, she’s actually a deeply sympathetic character who, quite frankly, has a point a lot of the time. It’s not an easy thing for a film to make us juggle our affections between the protagonist and their exasperated parent, and it’s to Wild Rose‘s enormous credit that this tricky dynamic is so textured and believable. And for all its well-drawn family drama, it never forgets to cut loose and remind us what a proper crowd pleaser looks like when the need arises. This is a really lovely film, a rare treat bursting with heart and packing a star performance with charisma to burn. Keep an eye out for whatever Jessie ends up doing next.